Listings are £50.00 for six months or £90.00 for 12 months. So just just a few additional sales could more than cover the cost. A listing includeds text copy, up to two pictures, map and a link to your website. Also links to your social media pages as needed - FaceBook, Twitter, Blog etc. "I would be delighted to renew for another year. May say I am really happy with the service you give us and it always seems to me you know our product well." We listed our business on Steve's St Ives Cornwall website and we have been really impressed by the level of service and the results.He has gone above and beyond the service other similar providers have offered by proactively supporting our online profile. His blogs are a good read too! 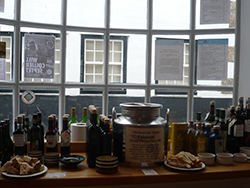 A cafe and delicatessen on The Digey which stocks a range of delicious Cornish produce plus Italian and Spanish specialities. The Cornish food range include cheeses, ham, chicken, duck, free-range eggs and much more. They also stock a range of speciality teas from Teapigs. Their Italian and Spanish range includes top quality olive oils, wine vinegars, cheeses, chorizo, serrano ham, prosciutto and Parma ham. They also specialise in olive oils with a range that includes Seggiano, Basilica, Unio Serana, Santa Tea, Boeri, Bio Cano, La Molazza and Olivade de la Luna.